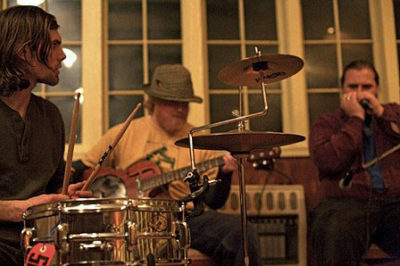 The festival’s live music kicks off with Open Mic Thursday afternoon and evening on the Otter Cove stage. Throughout the weekend enjoy brunch on Doe Bay Café’s patio adjacent to this stage and surrounded by breathtaking views of Otter Cove and the Salish Sea. Catch performances Friday and Saturday on the Doe Bay Garden Stage. With an open grassy field surrounded by food vendors, it’s the perfect spot to throw down a picnic blanket and chill-out in the company of fine tunes. 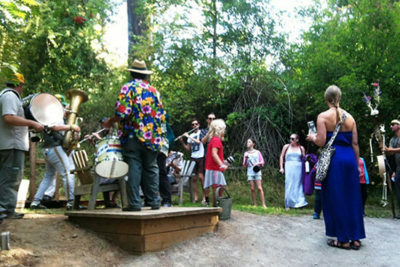 When the spirit moves you, shake a leg at the stage, or take a wander through the gorgeous Doe Bay Garden stage. After 10pm, performances go unplugged except for at the Yoga Studio. It’s the place to boogie down! Stick around for a long weekend and you will also find special unannounced performances in the Yoga Studio and surrounds throughout Sunday. 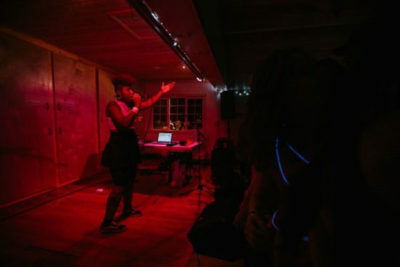 Secret shows are just one of the ways that set Doe Bay Fest apart from other festivals. 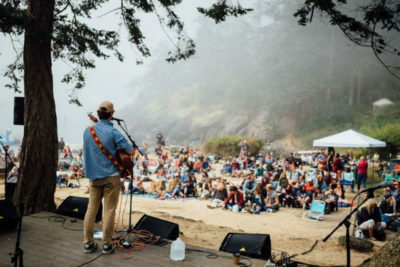 Sponsored by Freakout Records in 2018, the secret shows performed on the Otter Cove Beach are perfect for lounging seaside in the sand. Drop by to play in the ocean and see what magical music experience unfolds. Future gatherings may be referred to as “Beside the Apple Tree” given the iconic tree fell over this fall (we’re hoping to keep it alive)! This enchanting outdoor venue has hosted a decade of midnight shows and we look forward to continuing the story. 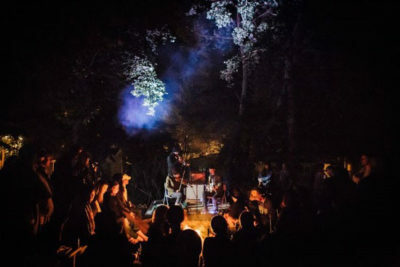 Hosted by Write Doe Bay in 2018, a fireside seat at the Campfire listening to incredible performers while roasting marshmallows and making smores (sponsored by Loge Camps) is the place to be. 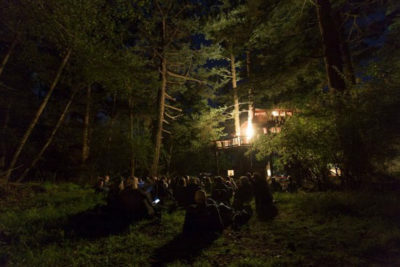 Last year’s Simon and Garfunkle Sing-A-Long with Planes on Paper beneath the Treehouse was unforgettable. 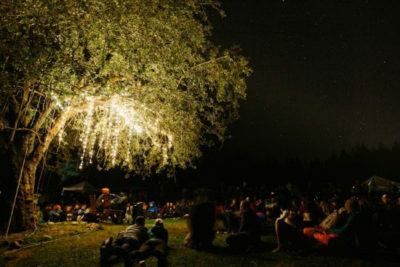 Looking up to the Treehouse and the stars beyond as the music pours across the audience is an iconic Doe Bay Fest experience. 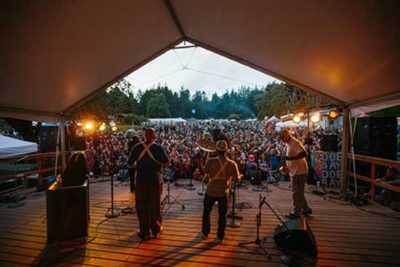 Performances in the intimate Doe Bay Café are accompanied by the delectable seed-to-table creations that have put the Doe Bay Café on the map for foodies from around the world. Overlooking the ocean, listening to music for the soul, cradling a craft cocktail. Yes please. 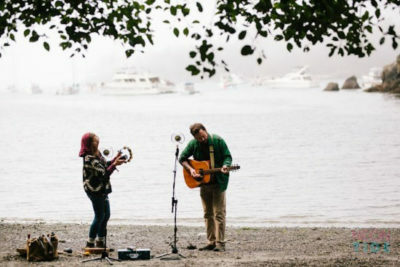 Pop up performances throughout the week of Doe Bay Fest grace the busking stage and draw crowds of all ages. The performers are all ages to – bring your instrument and go for it!